Butch and Emily Evans have owned the Huntsville-Conroe Rainbow franchise since 1982. They both hold I.I.C.R.C certifications. Butch is a Master Water Restorer, Master Fire Restorer, and a Master Textile Cleaner. They have 3 grown daughters, 4 grandkids, 1 dog, 1 cat, 15 chickens and 3 "late in life" sons (married to their daughters). Butch and Emily are both members and Elders at First Presbyterian Church of Huntsville, TX. 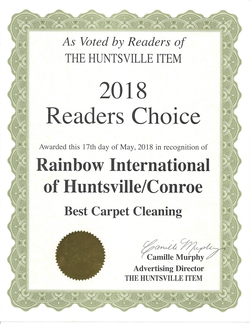 Rainbow International of Huntsville/Conroe has been awarded "Best Carpet Cleaners" by the readers of the Huntsville Item every single year since 1995. Brian Harig joined the Rainbow family in June of 2016 as the Business Development Associate. His main duties include maintaining our current business and growing new business. 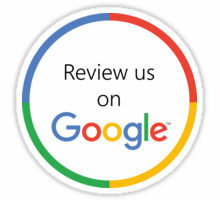 He is also I.I.C.R.C certified in Water Damage Restoration and Carpet Cleaning. Brian is also a professional photographer who loves traveling throughout the western United States to capture some amazing landscape photography. Jose Urbina has been with the Rainbow family since the fall of 2008. His business degree from Sam Houston State University has played a big part in the sucess of our business. Since Jose joined Rainbow, he has shown a remarkable aptitude for cleaning carpet, tile, upholstery and area rugs. His passion is making customers happy. He is I.I.C.R.C certified in Water Damage Restoration and Carpet Cleaing. Jose's new passion is traveling the world. He even lived in Europe for over a year and plans to return soon. Ashton Cudd graduated from Sam Houston State University with a major in Criminal Justice. Since Ashton joined our team in June 2014, he has received his I.I.C.R.C certification in Water Damage Restoration. His attention to detail has led him to become a first class technician. He could watch baseball all day if school and work would let him. Bradon Whitaker joined our team in 2016 and has quickly become a favorite amoung our customers. He moved from Dallas where he was working as a golf course attendant. He now attends Sam Houston State University and is majoring in Criminal Justice. He is always ready for hunting season to begin.